There are few regulations or guidelines specifically addressing intellectual property (IP)and antitrust issues in Portugal; however, the past years have been marked by relevant decisions of the Portuguese Competition Authority (PCA) and the Portuguese Competition, Regulation and Supervision Court (the Competition Court) in areas related to intellectual property: (1) a decision of the PCA to apply a more than €10 million fine to the Portuguese National Association of Pharmacies (ANF) for abuse of dominant position; (2) a decision regarding anticompetitive agreements involving pharmaceutical companies; and (3) a request for a preliminary ruling before the Court of Justice of the EU regarding the concept of discrimination in abuse of dominance. 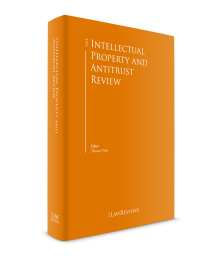 This chapter will mainly address these decisions and give a brief overview of the relevant IP and competition issues and rules in the field of antitrust and IP enforcement actions. With regard to antitrust, the past years were marked by three decisions of the PCA. In Case 13/2009, ANF and two satellite companies, Farminvest and HMR, both controlled by ANF, were fined for abuse of dominance by refusing to provide other companies specialising in market studies with data related to the sales of medicines to final consumers at the pharmacy level. Although the data involved is not protected by IP, the information itself is used by the pharmaceutical industry and particularly by IP holders to monitor the market and possible infringements of their IP rights. ANF is the largest association of pharmacies operating in Portugal and, through Farminvest, it controls a company named HMR that offers market studies in the healthcare sector and specialises in data related to sales of medicines by pharmacies to final consumers. The case was based on a complaint lodged in 2009 by IMS, an international company specialising in collecting the same type of data from both wholesalers and pharmacies, and Apifarma, the pharmaceutical companies trade association. After more than five years of investigation, the PCA reached the conclusion that ANF had breached Article 102 of the Treaty on the Functioning of the European Union, and the equivalent rule in the Portuguese Competition Act, by increasing the price for the supply of the data by pharmacies to IMS. Roughly at the time that the issues with access to data began, ANF incorporated HMR, a subsidiary company that had privileged access to the data and started to compete with IMS. The plaintiff alleged that, with the new prices, which were about 2.5 times the previous price, it was effectively excluded from the market. Apifarma alleged that the strategy of ANF effectively created a monopoly for HMR and, in view of the importance of this type of data for the industry, this would put Apifarma members at a disadvantage. The PCA imposed a fine of more than €10 million on ANF and its controlled companies. The case judgment was confirmed by the Competition Court, the specialised court with jurisdiction over competition enforcement cases. The Court found that the PCA was right in finding the alleged infringement, and concluded that ANF had indeed tried, through margin squeeze, to prevent potential or actual competitors from entering the market. The Court found that this behaviour would have made it impossible for any competitor, even one as efficient as ANF, to obtain a profit margin that would enable it to enter and effectively compete in the market with ANF. Nevertheless, on the basis of the size of the relevant market, the Court decided to reduce the fine from €10.3 million to €6.8 million. A decision by the Lisbon Court of Appeals is expected on this case. In Case 2014/4, the PCA assessed an agreement between three pharmaceutical companies, AstraZeneca, Teva and Ratiopharm, relating to the sale of rosuvastatin generic products. The PCA concluded that the settlement agreement executed between the parties in the context of proceedings that had been filed by AstraZeneca against Teva and Ratiopharm claiming an alleged patent infringement following the launch of rosuvastatin generic products by the two defendants was not in breach of the applicable antitrust laws. The PCA considered that there was no evidence that the terms of the settlement agreement were outside the scope of the arbitral proceedings nor that Teva or Ratiopharm had received any advantages from withdrawing their rosuvastatin generic products from the market. This was the first PCA decision on the issue of agreements between originators and generic producers based on a possible 'pay-for-delay' infringement. One significant aspect to highlight is that the case started with a request made by the Ministry of Health after being informed of a letter sent by Teva to its clients letting them know of the settlement agreement with AstraZeneca. This is a relevant fact, since the public administration has traditionally been reluctant to bring matters to the PCA and to invoke competition law issues in respect of its relations with private parties in general. Lastly, in a recent case, a request for a preliminary ruling to the Court of Justice of the EU was submitted by the Competition Court in connection with a complaint of abuse of dominance in collective management of intellectual property rights. In June and October 2014, PT Comunicações (PT), one of the major Portuguese telecom companies, filed a complaint with the PCA against GDA, the only Portuguese entity engaged in collective management of IP and related rights. In essence, PT submitted that GDA charged excessive fees for access to the television signal in pay-TV, since it applied higher prices to PT than to one of its major competitors. The PCA decided to close the case on the basis that the price difference per se did not jeopardise PT's competitive position in the market and, as such, did not have anticompetitive effects. The PCA argued that the results of the assessment of the price differences applied by GDA could not set aside the possibility of PT being capable of absorbing the cost difference at stake, considering that the costs are of low significance in relation to PT's profits and the cost-effectiveness of these services. In analysing the requirements for abuse in discriminatory pricing, the PCA took into consideration the European Union Court of Justice's reasoning in British Airways2 and considered that the existence of a discriminatory practice does not necessarily involve a competitive disadvantage, and that concrete evidence of the discrimination being able to create such a disadvantage was required. Furthermore, it was stated that a different understanding would contravene the case law of the Court of Justice since it would result in every discriminatory practice by a dominant player entailing a violation of Article 102(2)(c) TFEU. In particular, the PCA concluded that it had not been demonstrated that competition between retailers could be influenced by the prices charged to wholesalers, such as PT. On appeal, PT argued that the PCA had made an incorrect interpretation of EU law since it applied more stringent requirements. PT considered that the criterion established in EU case law for abuse in discriminatory practices was the simple demonstration that such practices are able to distort competition (i.e., to place a commercial partner of the dominant player at a competitive disadvantage). The Competition Court then referred the case to the Court of Justice, as a preliminary ruling, since it noted that it was not clear from previous case law as to the concept of distorting competition for the purpose of assessing violations of Article 102(2)(c) TFEU. Considering that the decision of the PCA to dismiss the case was based on the small difference between the costs borne by PT and the results in the additional wholesale costs – which was demonstrated by the increase in PT market shares during the relevant period, showing it was able to bear the extra amount charged internally – the Court stressed the importance of the concept of distorting competition, as adopted in British Airways, in the PCA's reasoning. The Court further noted that the Court of Justice precedents were not clear concerning the concept of distorting competition for the purpose of applying Article 102 TFEU, especially in regard to the existence of evidence of such a distortion, and that there was no distinction as to the seriousness, circumstances or effects of distortions to competition in this area. In this sense, the Court considered that it was reasonable to ask whether the reasoning for the PCA's decision was innovative in the sense it is not directly supported by the aforementioned EU case law. Does the concept of distorting competition for the purposes of Article 102(2)(c) TFEU depend on an additional assessment regarding seriousness, relevance or importance of its effects in the competitive position or capacity of the relevant company, namely considering its capacity to bear the difference of costs internally? If the difference is of low impact, is a decision of lack of evidence of a distortion of competition compatible with the case law set forth in British Airways and Clearstream? Is Article 102(2)(c) TFEU to be interpreted as requiring the disadvantage suffered by the relevant company to correspond to a minimum percentage of its cost structure? Alternatively, should it be construed as requiring the disadvantage to correspond at least to a minimum difference between average costs incurred by competitors? Could this provision be interpreted in such a way that would require the amount corresponding to the competitive disadvantage to be higher than the price difference applied by the dominant player? If the answer to these questions is affirmative, how should the minimum amounts be defined? Should the extra costs borne by the relevant company in each year be lower than the minimum amounts, as defined according to question (f), can the assumption made in Clearstream pursuant to which 'the application to a trading partner of different prices for equivalent services continuously over a period of five years and by an undertaking having a de facto monopoly on the upstream market could not fail to cause that partner a competitive disadvantage' be set aside? Apart from the substantial issues at stake, it should be noted that this case is one of the first recorded instances where a complainant has appealed a decision by the PCA not to pursue an investigation under the new Portuguese Competition Act, enacted in 2012 (Law 19/2012 of 8 May), which substantially enhanced the rights of complainants in competition cases and introduced the right of a complainant to appeal against a decision not to pursue an investigation. More importantly – and as far as the authors are aware – this is the first request for a preliminary review by the Competition Court concerning national competition investigations. The request for a preliminary review by the European Court of Justice is a clear sign that the Competition Court, though formally a first instance of appeal, will not refrain from exercising its specialised remit by addressing directly the Court of Justice on matters of interpretation of EU competition law. The recent GDA case is one of the most relevant decisions regarding discriminatory licensing of IP rights in Portugal. The outcome of this case is of extreme relevance for the Portuguese market in the collective management of copyrights and related rights since it will determine how relevant entities are to deal with the fact that they are dominant in their respective markets. As mentioned above, the outcome of the preliminary ruling submitted to the Court of Justice will be decisive in determining pricing practices in the collective management of copyrights and related rights, and their respective licensing arrangements. Although price differences may be allowed under Article 102(2)(c) TFEU, if the Court of Justice supports the PCA's reasoning in the GDA case, monopolistic entities engaged in the collective management of IP rights will enjoy more freedom in establishing discriminatory prices and licensing, and favouring close commercial partners. In addition, although the ANF case is not based on a refusal to deal, the effect of the described increase in the prices of the sales data was, allegedly, equivalent to a refusal. The PCA identified a market for pharma-specific patient and prescription studies and a market for data with commercial value that is required to undertake those studies. Through its links with pharmacies, ANF enjoyed a dominant position in the provision of data, but it was also found to be dominant in the provision of studies through HMR. This reasoning was essentially upheld by the Competition Court. The authority construed the case as margin squeeze and referred to the EU case law on that. It gave special emphasis to the fact that, on the basis of the pricing strategy ANF applied in the studies sold by HMR, the prices charged to IMS effectively prevented it from competing. As is usual in margin squeeze cases, the analysis made by the PCA relies heavily on the economic assessment of the margin implicit in the prices charged. Once it established that ANF was dominant in both groups of relevant markets (data and studies) the finding of abuse was essentially a matter of determining whether the price was too high, as claimed by the plaintiff. Thus, the ratio decidendi will probably not be followed in other cases. One of the specificities of the Portuguese IP legal regime relates to patents in the pharmaceutical sector and, in particular, to disputes concerning industrial property rights, including preliminary injunctions, related to reference medical products or to generic medicines, which are subject in Portugal to ad hoc or institutionalised mandatory arbitration.5 According to the law, the industrial property right holder that wants to enforce its right has 30 days to present a request for arbitration following publication by the Portuguese National Authority for Medicines and Health Products (INFARMED) of notice that a marketing authorisation (MA) has been requested for a generic medicine. Although the arbitration will not suspend INFARMED's analysis of the MA application, the idea behind this regime seems to be to allow IP disputes to be decided before generic medicines have obtained the necessary regulatory approvals to enter the Portuguese market, thus avoiding unnecessary delays in the marketing of generic medicines. As may be recalled, Portugal was singled out in the 2009 Pharmaceutical Sector Inquiry by the European Commission for having a high number of cases pending in the administrative courts filed by patent holders against regulatory authorities that were in the process of granting MAs and price approvals to generic medicines. These proceedings came to an end following the approval of the new arbitration regime. In spite of the considerable attention that patents have been receiving over the past few years, so far no consideration has been given to statute, regulation or case law on the antitrust implications of the adoption of proprietary technologies in industry standards. Furthermore, there is no relevant case law on the licence terms for such standard-essential patents. Under Portuguese law, the concept of merger for the purposes of merger control includes the direct or indirect acquisition of control over the assets of a company, and as such, the acquisition of ownership, use or enjoyment of the assets of a company or parts of it. In this sense, a transfer of IP rights may constitute a merger where the IP rights involve the ownership of assets of the previous holders. In most cases, the relevant transaction will be an asset deal that includes IP rights, and notification obligations will arise in respect of the acquisition of the assets. While the European Commission has for several years been monitoring the limits of legitimate IP protection and related litigation and, in particular, patent settlements and more broadly pay-for-delay arrangements, until recently the PCA had not started to actively investigate these types of agreement. The AstraZeneca case concerned an agreement whereby Teva and Ratiopharm stopped selling rosuvastatin generic products in Portugal. Teva issued a notice to wholesalers informing them of the terms of the agreement, which became known to the Ministry of Health, which ultimately informed the PCA. This led the PCA to conduct dawn raids of several companies. AstraZeneca has a patent over rosuvastatin, an active substance that is sold under the commercial names of Crestor and Visacor. The patent is due to expire in 2017, but Teva and Ratiopharm launched a rosuvastatin generic before the patent expiry date. AstraZeneca filed patent infringement proceedings but the parties eventually settled and one of the conditions was that Teva would cease to sell its generic drug. The assessment of the PCA concerned the issue of the possible scope of the agreement. On the basis of ECJ case law the PCA stated that settlement agreements that are limited to settling the patent litigation and do not go beyond what is required in that context are acceptable. The PCA highlighted that the payment of compensation by AstraZeneca to Teva would be problematic and would raise antitrust concerns. However, there was no evidence that the agreement would extend beyond the scope of the dispute nor that the defendants would receive any advantages from removing the generic product from the market. The documents collected in the dawn raid were also reviewed with the aim of trying to understand if there was another agreement, or any sort of undertaking, that followed the settlements. Again, the PCA concluded that there was no evidence that such an extension of the agreement existed. The decision provides valuable guidance on the position of the PCA on settlement agreements. If the terms of the settlement do not impose on the generics company more obligations than those that would arise from the patent rights owned by the originator, the agreement does not go beyond what is acceptable. This is a clarification that is very useful for companies, but it is submitted that it may be difficult to have a clear view of what rights the patent gives to both parties, in particular if the settlement allows certain rights to the generics company. The position of the PCA seems to rely on an understanding that such an agreement should only make impositions on those companies. It also follows that where there is a payment to the generics company related to a decision to leave or not enter the market there will probably be an issue in terms of Portuguese competition law. This is a clear and coherent position, but the complexity of the situations that arise from patent litigation in the pharma sector will probably test this interpretation of the law. The recent cases of the PCA mentioned above demonstrate a higher importance of IP-related matters in competition regulation in Portugal. As shown, there is a high number of disputes arising from IP rights, especially in the pharma sector, and recent developments have demonstrated that the PCA is currently paying more attention to competitive concerns arising from not only the mentioned disputes but also from the activity of pharma associations. The PCA recently issued its first decision concerning settlement agreements in patent disputes, which are very common in practice, and this may influence the outcome of future disputes. On a different level, collective management of copyrights and related rights was also subject to the scrutiny of the PCA, by assessing possible abuse of dominance in this sector. The outcome of the preliminary ruling submitted in relation to GDA's alleged discriminatory prices will dictate future behaviour of entities engaged in this market. Although the recent PCA decisions are a result of complaints, more supervision of competitive constraints resulting from IP rights, and particularly in the pharma sector, is expected. 1 Carlos Pinto Correia is a partner, João Pateira Ferreira and Raquel Galvão Silva are managing associates and Gonçalo Hogan is a junior associate at Linklaters LLP. The information in this chapter is accurate as of July 2017. 2 British Airways v. Commission, Case C-95/04 P, Judgment of 15 March 2007. 4 Clearstream v. Commission, Case T-301/04, Judgment of 9 September 2009, paragraph . 5 See Law No. 62/2011 of 12 December 2011.